Think of them as yellow pint-sized capsules of humor that head straight to funny bone of the very young. There, they must tickle; how else to explain the uncontrolled laughter at the utter nonsense taking place on the screen? They speak in gibberish, they sing, they dance, they slug each other; they seem to be making up the plot as they scurry along. Some sequences make absolutely no sense; often there is no discernable scene-to-scene continuity. The kids in the audience don’t seem to mind; this is the humor of Charlie Chaplin and the Marx Brothers in animated form. It’s vaudeville for the pre-school and primary-grade generation. In the first two movies in the “Despicable Me” series, the super villain Gru (Carrel) was in control and the Minions showed up periodically. The writers used them sparingly – to punctuate the action, rather than to drive it. Here, there’s too much of everything, especially the Minions, who are in every scene; the human characters are mostly bland. To coin a phrase: Too much of a good thing generally means we’re in the third movie of the franchise. There’s plenty of babble and characters mocking each other with nonsense sounds; the Minions seem to communicate by attitude, inflection, and slapping each other in the head. The movie takes every possible opportunity to show Brits drinking tea. 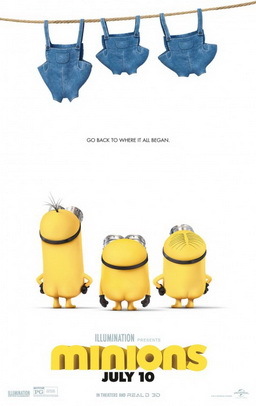 And those who grew up in the ‘60’s will find the soundtrack of this movie to be the soundtrack of their youth – but there’s not nearly enough real humor in here; the individual Minions lack distinctive personalities; there are no emotional moments. It’s all barely enough to hold the attention of those who expect a movie to be more than a series of pratfalls. For the past several months, we’ve seen these lovable creatures in trailers, fast-food commercials, and on movie posters, singing and dancing and promising us a great new adventure this summer. In this case, the promise was much more entertaining than the delivery.